Stock photo shows the dark impressive dome with the golden boy statue sits atop the Legislative Building. 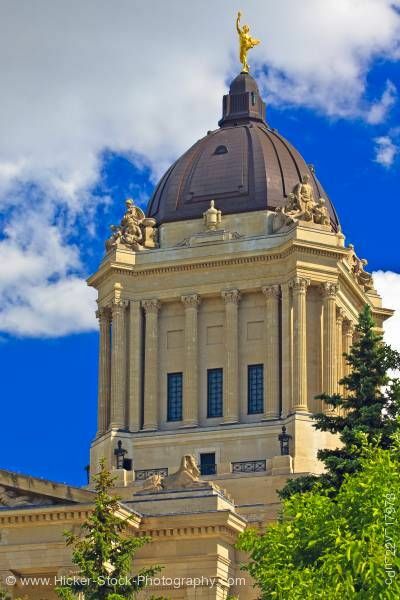 The dark impressive dome with the golden boy statue sits atop the Manitoba Legislative Building. This stock photo shows the dark impressive dome with the golden boy statue sits atop the Legislative Building. The golden boy statue carries a torch in one hand and a sheaf of wheat in the other. Beneath the dome, each corner has sculptures of humans that sit above two of the ornate columns. In-between are four additional columns with long rectangular windows trimmed in a dark metal. Below the four columns and is a walkway in each section with a iron railing. Flanked on each base are iron lanterns. The building is constructed of Tyndall stone, a tan colored smooth stone. This view of the dome also shows a sphinx sitting on a base above the main pediment. In the foreground to the right are tall trees. The background shows white puffy clouds and a bright blue sky. The Golden Boy figure and dome of the Legislative Building in the City of Winnipeg, Manitoba, Canada.